FOXBOROUGH, Mass. (AP) — Seven-on-seven drills. Pretending that everything is normal. It’s all part of the New England Patriots getting ready for the regular season. Three months after losing the Super Bowl to the Philadelphia Eagles, the Patriots held their second organized team activity on Tuesday — without Tom Brady and Rob Gronkowski. Coach Bill Belichick declined to comment on the absence of two of his biggest stars, and their teammates claimed to be too focused on their own jobs to worry about who wasn’t there. Asked if he knew Brady’s name, Etling smiled. Tuesday’s practice was not mandatory, and Brady and Gronkowski were among more than a half-dozen other players who skipped it. Belichick said he would only comment on the players who were there. Brady, who will turn 41 in training camp, was reportedly in the area with his personal guru and trainer instead of Gillette Stadium, and Gronkowski was said to have joined him. 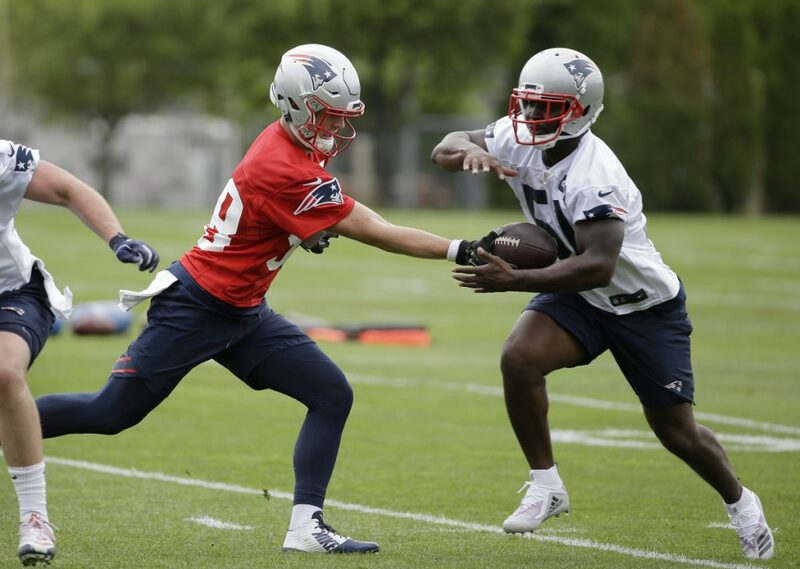 Both players had quarreled with the Patriots this offseason over their contracts, with the Pro Bowl tight end dangling the possibility of retiring before informing the team last month that he will return. Brady’s dissatisfaction reportedly stems from a below-market contract — two years, $41 million — and talk of speeding up the plan for Jimmy Garoppolo to succeed him as the starter. Garoppolo was traded to San Francisco, which gave him a contract that guarantees him more than $60 million in the first two years. Brian Hoyer, who was brought in to be the backup, said Brady’s absence was not a distraction. Without Brady, Hoyer got the chance to run drills with the starting unit on Tuesday and said it was beneficial.